Due to high demand please allow 2-3 weeks to process orders on this product. 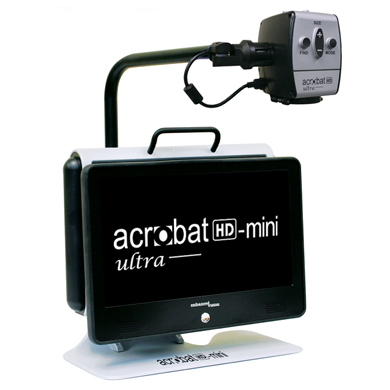 See near, far and everything in between with Acrobat HD-mini ultra. Full high definition allows you to experience vivid colors and contrast, giving you a beautiful crystal clear picture and vibrant display. Its small footprint and lightweight design provides true portability from the classroom to home and work. A generous 13.3” display offers a large field of view, allowing you to see more on the screen. 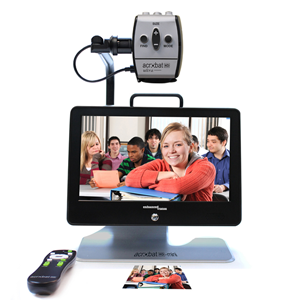 Easy to set up and ready to use, just take it out of its optional rolling case and you’re ready to magnify in seconds! Enjoy many hours of battery operating time and increase your productivity. Simply connect to a wall outlet for uninterrupted usage. Your Acrobat HD-mini ultra's 13.3” monitor will display crisp, colorful, clear & vibrant images in high definition. View family pictures, textbooks, maps, charts, blackboards, presentations and so much more.